Top models strutted down the Haute Couture runway wearing the provocatively striking eyewear, the show highlights bespoke versions of three signature styles (hand made in Italy) in collaboration with Alexandre Vauthier; Josseline, Ketti, and Ansolet. These designs are customized in a neutral pastel palette and impeccably adorned in Swarovski crystals. Josseline, a modern meets retro sunglass inspired by the iconic Mikli Asymmetric frame originally launched in the early 80’s. The strong angles and geometric lines define the frame as the quintessential Alain Mikli aesthetic in combination with a conceptual twist reminiscent of the avant-garde philosophy of Alexandre Vauthier. Ketti, the evolution of last season’s standout style Edwidge, is a rimless combination design with an ultra-shallow lens. Ansolet pairs bold acetate with a smaller lens for a unique wrapped design. The thick contoured temples offer coverage and privacy for a lavish futuristic look. The frames are available in recognizable Mikli colors of Noir, Rouge, Blanc, Havana, and Blue Mikli, a new lux marble acetate exclusive to the collaboration. 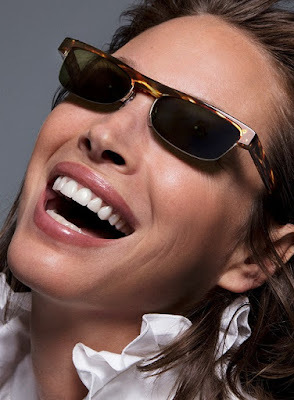 This season’s campaign stars’ original 90’s supermodel, Christy Turlington captured by celebrated fashion photography duo Inez and Vinoodh, a strong follow up to the 2018 campaign that featured the legendary Kate Moss. Alain Mikli Sunglasses for Alexandre Vauthier SS19 collection will be available online at Sunglasshut.com (NA, UK, FR only) and Alain Mikli boutiques worldwide. The collection is also available in select department stores, fashion boutiques and opticians.